Pleasant hotel grounds. Great menu. Clean rooms. 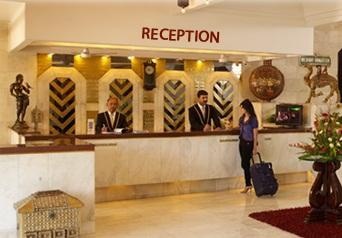 Hotel Hillock is a popular choice amongst travelers in Mount Abu, whether exploring or just passing through. The property features a wide range of facilities to make your stay a pleasant experience. 24-hour room service, free Wi-Fi in all rooms, daily housekeeping, 24-hour front desk, luggage storage are on the list of things guests can enjoy. Designed for comfort, selected guestrooms offer locker, towels, television LCD/plasma screen, sofa, umbrella to ensure a restful night. Enjoy the hotel's recreational facilities, including hot tub, outdoor pool, children's playground, kids club, pool (kids), before retiring to your room for a well-deserved rest. No matter what your reasons are for visiting Mount Abu, Hotel Hillock will make you feel instantly at home. Peaceful yet near to the city. Spacious parking and space for drivers. Location and Ambience is awesome. Buffet breakfast is one of the best vegetarian. Breakfast is simply amazing. Very nice experience and breakfast. Excellent restaurant staff. Excellent ambiance and service. Food and staff were outstanding. Hotel food was delicious. Dinner experience is unforgettable. Food and staff were outstanding. Facilities are excellent. EXCELLENT facility to stay.. Gardens & swimming pool well maintained. With variety of cocktails. Great bar. Food and bar excellent. Staff & amenities is also excellent. Luxury room is spacious for a family. Amazing rooms. Bath tub is very small. Bathtub is small. Third bed there is no. Price and amenities available. High charges. Hotel is overpriced.